ABOUT US | Kas Otomotiv Sanayi Ltd. Şti. Dreams have come true on short notice in Kas Automotive. It is grown and developed a strategic partner to Turkey and World Giants in automotive and energy industry. Kas Automotive denoted the journey that three partners have begun to come together in order to make a difference with their experiences in 150 m2 area by the year of 2004. Their success in their business became to demands of the production of new goods, in this context they established sheet print and montage department, it is done sheet pattern, sheet shaping and weld through. It is got into act with 140 employers on totally 6.000 m2, in Bursa Nilüfer Organized Industry Region. Change and development-oriented, flexible, agile and become a brand that makes a difference by creating a difference in the industry, offering value for all stakeholders. We are a constantly evolving, collective and environmentally conscious brand that focuses on all our stakeholders with our precision production competence, using advanced technology in the Automotive Sector, with our flexible production and understanding of creative production, aware of the changing needs of our customers. 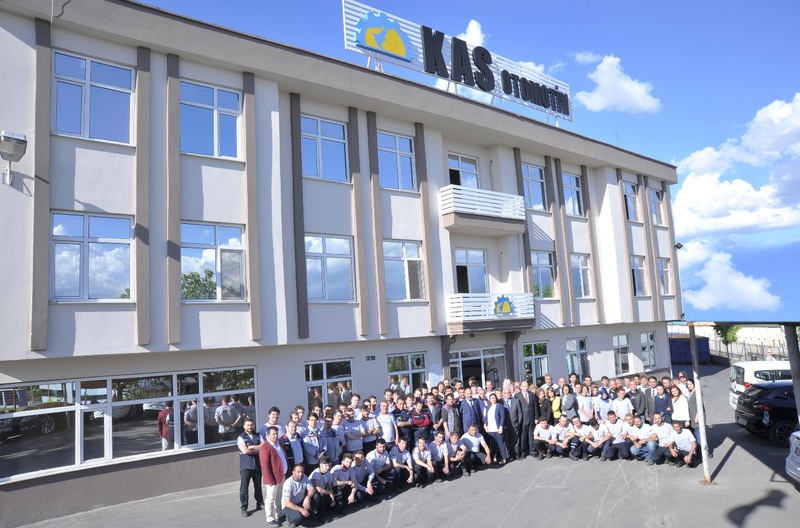 Respect for human and human dignity: KAS Automotive prepares respect for its employees, customers, business partners and all segments of society. As KAS Automotive we are against all kinds of discrimination and we regard any kind of difference such as religion, language, race, gender, nationality, culture in society as a wealth. Equal Opportunity: We believe that society can be at peace in an environment where mutual trust and justice are prevailing. For this reason, KAS Automotiv is paying attention to equal treatment and equal opportunity. We treat our employees honestly and fairly, regardless of their religion, language, race, gender, nationality, culture or marital status, physical disability, and we all have equal opportunity. Clarity: In the context of our “open door” policy, we encourage our employees and other stakeholders to express their opinions and opinions, and to voice their suggestions and complaints. Openness, accessibility and open discussion within our company support this policy. We inform our employees on time and accurately. Honesty: Relations in KAS Automotive are based on honesty principle. Our employees are honest with our relationships with our other institutions and stakeholders, avoiding approaches that would damage mutual trust. Our employees do not receive gifts that affect their impartial decisions and behavior and do not give gifts for the same purpose. Participation: The participation of our employees in the decisions made and in the activities being organized is the basis of our success. We give importance to their ideas and for this purpose we encourage their participation in any kind of work that they can express their ideas. Use of Resources: Our employees are sensitive to the use of social and environmental resources. All of our employees are aware that Natural Resources is a sustainable resource. With this consciousness, company sources such as machinery, equipment, software, hardware, information in the workplace avoids any use of natural sources. Privacy: Our services, ideas, concepts, strategies, customer and employee information are in KAS Automotive property. Protect this information, share it irregularly or without permission. For this reason, it is defined what information is to be shared outside the Authority, its contents and by whom, and in what environments. Respect for Intellectual Property Rights: KAS Automotive respects all intellectual and industrial property rights in a wide spectrum ranging from the experience, talent and creativity of human intelligence to goods and services, trademarks, industrial designs, scientific and technological inventions. It acts in accordance with national and international laws on the protection of rights. Legal Obligations: KAS Automotive is based on the legal obligations determined. Our social responsibility is based on our consciousness, acting in accordance with the law, being open and trustworthy, acting ethically, accountability is our basic principles. All of our company’s managers are responsible for keeping records in accordance with company and customer needs and legal obligations and for storing and disposing of records in accordance with the procedure. Responsibilities to Our Customers: As KAS Automotive, we know that we will be with our customers in the future. For this reason, we communicate openly with our customers, we do not store any information. We respect and protect customer property. We understand that our customers need to understand the changing needs and anticipations and meet customer and company interests. Social Responsibilities: We are an integral part and participating member of our country and the society we live in. We are sensitive to the needs of society. It is important for us to improve our life in our country and around the world and we contribute to it. We are aware of the effect of this contribution in our long-term success and existence. Our employees consider a part of the time and energy for social purposes by considering the interests of society and country in their activities and social lives and as KAS Automotive Family; We are a debt observer of our Social Responsibility.